Ex-Christadelphian Voice of Reason (ECVoR): Does The Grand Canyon Provide Evidence For A Global Flood? Below I will list the headings from the AiG article, followed by quotes that refute the creationists' claims. "Shells on mountains are easily explained by uplift of the land. Although this process is slow, it is observed happening today, and it accounts not only for the seashells on mountains but also for the other geological and paleontological features of those mountains. The sea once did cover the areas where the fossils are found, but they were not mountains at the time; they were shallow seas." "A much simpler explanation is that the nautiloids lived, died, and settled to the ocean floor naturally, where typically mild, deep-ocean currents aligned their shells. We find this kind of pattern in innumerable fossil outcrops in uncountable locations around the world. There’s nothing in these fossil locales that require extraordinary processes, and nothing that suggests a mass kill." "Pure, thick-bedded limestones like those of the Redwall are usually deposited relatively far from shore. The sea had encroached far inland during this period. Yet shallow-water fossils are present throughout the formation. This shows that the water was never very deep--probably at maximum 300 feet. How can 450 feet of limestone accumulate in 300 feet of water? Offshoresubsidence is the key. As the sea floor slowly subsides, lime muds slowly accumulate, keeping the water depth approximately constant during the entire deposition. In this way, a thick sequence of rocks can form entirely in shallow water." "While many sedimentary rock layers do cover vast areas of the continents, no single layer covers an entire continent from one end to the other as the flood geologists imply. Rather, the rock layers overlap one another like leaves piled up on a lawn. Rather than finding evidence of one massive deluge, geologists find abundant evidence of multiple periods of rising and falling sea level that varied by as much as 120 m higher or lower than at present. It's the combination of low-standing continental crust and high-standing sea level that results in these sedimentary layers. 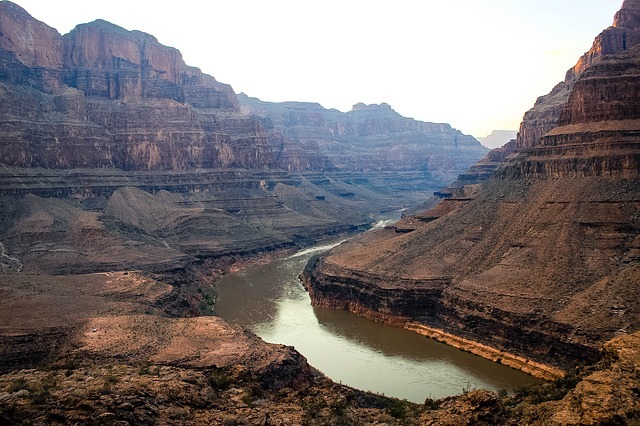 In our chapter Sedimentary Rock Types and How They Form, we describe how layers of sedimentary rock were deposited in the Grand Canyon region as sea level repeatedly rose and fell. With each rise in sea level, shorelines moved inland along with the deposits of sand, shale, and limestone that comprise the geological formations we see in the canyon. Geologists recognize that deposits at some locations accumulated by flows of sediment across the seafloor as flood geologists claim. But these are rare in the Grand Canyon! Most of the sedimentary rock layers there formed in very shallow water or just above sea level. Evidence of periods above sea level is evident from abundant sedimentary structures such as mudcracks, raindrop prints, ripple marks, cross bedding, and small animal tracks (we show many photos of these structures in our chapter Sedimentary Structures, Clues from the Scene of the Crime)." "In our chapter Sedimentary Rock Types and How They Form, we address the claim that the Coconino Sandstone could have been deposited by a global flood. This rock unit is distinguished by cross bedding, which are dipping, parallel layers within the formation that are seen in modern sand dunes. We point out how conventional geologists see the cross bedding in these sandstones, along with other features such as trace fossils (animal footprints), as strong evidence for wind-driven deposition in a giant dune sea, such as in Namibia, Africa today. Dry sand dunes don’t fit in the middle of a year-long global flood, so flood geologists argue that these cross beds were formed through underwater processes such as migrating sand waves." "Tapeats Sandstone averages 525 million years old and is made of medium- to coarse-grained sand and conglomerate that was deposited on an ancient shore (see 3a in figure 1). Ripple marks are common in the upper members of this dark brown thin-bedded layer." "Formations in the Grand Canyon Supergroup reflect a variety of depositional settings, including low energy flow (with accompanying ripple marks), mudflat, subaqueous delta, floodplain, tidal flat, shallow subtidal to intertidal, tide/wave affected shoreline, and high energy flow environments. Numerous beds with mud cracks and raindrop imprints are found, indicating long exposure to the atmosphere before subsequent burial. Buried channels can be found in several formations, indicating periods of erosion before subsequent burial. Most also have beds of stromatolites—colonies of blue-green algae (cyanobacteria) in shallow water which built up through the trapping of fine sediments"
The Thunder Springs Member of the Redwall is famous for its alternating light and dark bands of fossil-rich chert and carbonate rock. Such numerous, long, and continuous beds of alternating composition are inconsistent with a single catastrophic flood event." "The Coconino Sandstone is typically buff to white in color. It consists primarily of fine well sorted quartz grains, with minor amounts of potassium feldspar grains deposited by eolian processes (wind-deposited) approximately 260 million years ago. Several structural features such as ripple marks, sand dune deposits, rain patches, slump marks, and fossil tracks are not only well preserved within the formation, but also contribute evidence of its eolian origin." "Flood geologists claim that rock layers in the Grand Canyon are flat and show little evidence of erosion. They refer to “knife edge” contacts between layers that do not reveal erosion between layers. But, it’s far from flat and “knife edge” in character. In many places along the canyon wall the contact projects several feet upward into the overlying Tapeats Sandstone like miniature islands. It’s clear that layer upon layer of sand covered this bumpy surface as the overlying unit was deposited. Gravel to boulder size fragments of the underlying rock are incorporated in the base of the Tapeats Sandstone along the Great Unconformity, providing evidence of erosion and exposure of the underlying bedrock." "The Hermit Formation has filled-in channels in its sandstone units with structures commonly associated with point bars in meandering streams. Some buried channels in the Hermit actually cut downward into the Esplanade Sandstone of the Supai Group, indicating deposition was interrupted by a long period of erosion." "The upper and lower contacts of the Redwall Limestone are both unconformities"
"An unconformity is a buried erosional or non-depositional surface separating two rock masses or strata of different ages, indicating that sediment deposition was not continuous. In general, the older layer was exposed to erosion for an interval of time before deposition of the younger, but the term is used to describe any break in the sedimentary geologic record." "There are at least 14 known unconformities in the geologic record found in the Grand Canyon." "Most people have a mental image of the flat lying sedimentary rocks in the Grand Canyon because that's what you see in most photographs and from many overlooks from the rim. In fact, there are many examples of tilted, folded, and faulted rock in the Grand Canyon. We describe them in the chapter Broken and Bent Rock, Fractures, Faults and Folds. Along the length of the canyon, the Colorado Plateau is broken by several prominent faults. The Kaibab Monocline is an immensely broad downward bend of the entire vertical stack of rocks. More severe and smaller scale folding is observed in the Tapeats Sandstone in the Carbon Creek area. Flood geologists say that such folding can only occur if the sedimentary layers are so recently deposited that they are still soft, not old, hard rock. As evidence they report that the folds lack fractures, which would be evidence of hard-rock breakage during folding. On the contrary, we show in our book that the folds are riddled with fractures and contain evidence of brittle and flexural slip within and between layers in the folds. These absolutely cannot form in recently deposited sediment, as claimed by flood geologists." "Snelling states that these layers could only have been thus deformed if they were still in a soft, unconsolidated state immediately following their deposition during the Flood. As Snelling has stated elsewhere,“When solid, hard rock is bent (or folded) it invariably fractures and breaks because it is brittle. Rock will bend only if it is still soft and pliable”. The uninformed layman may be impressed by this argument, but it is shameful for a PhD geologist like Snelling to make this claim. Obviously, solid rocks at atmospheric pressure and temperature will fracture if you try to bend them. But every geologist knows that since the 1960s geophysicists have been able to attain high temperatures and high pressures in the laboratory which mimic conditions several miles deep in the earth, and have demonstrated that at these conditions and with slow deformation, rocks can easily bend without major fracturing." "In an effort to provide evidence of deposition in rapid succession during the Flood (and deformation immediately thereafter), Dr. Snelling cites one of the most powerful arguments against his interpretation of geologic history. According to Dr. Snelling's view of the Flood, we should not expect to find abundant evidence of brittle deformation in these rocks, but in fact we find it everywhere. Brittle faults and fractures are testament, rather, to the deep time behind geologic processes others have come to appreciate." "It is these false assertions, that "these hardened sedimentary rock layers has(sic) been bent and folded, but without fracturing" repeated over and over that are a major fraud of "Flood Geology." I am particularly impressed by two features of this claim. The first is that it is a bald-faced lie. The second is actually two points related to the photograph. What is offered is a very poorly taken photo from a considerable distance with very bad lighting. Creationists use it to support their gross falsehoods. The second is that the "geology students" from the Institute for Creation Research posed in the photo are placed directly in front of the very fracturing that Snelling and Austin falsely claim is absent. " How do mainstream scientists think the Grand Canyon was formed? You can find a lot of excellent summary material on Wikipedia. While it is not an authoritative source in itself, it does quote many external sources that you can often read for yourself. "The geology of the Grand Canyon area includes one of the most complete and studied sequences of rock on Earth. The nearly 40 major sedimentary rock layers exposed in the Grand Canyon and in the Grand Canyon National Park area range in age from about 200 million to nearly 2 billion years old. Most were deposited in warm, shallow seas and near ancient, long-gone sea shores in western North America. Both marine and terrestrial sediments are represented, including fossilized sand dunes from an extinct desert. There are at least 14 known unconformities in the geologic record found in the Grand Canyon. Uplift of the region started about 75 million years ago during the Laramide orogeny; a mountain-building event that is largely responsible for creating the Rocky Mountains to the east. In total, the Colorado Plateau was uplifted an estimated 2 miles (3.2 km). The adjacent Basin and Range Province to the west started to form about 18 million years ago as the result of crustal stretching. A drainage system that flowed through what is today the eastern Grand Canyon emptied into the now lower Basin and Range province. Opening of the Gulf of California around 6 million years ago enabled a large river to cut its way northeast from the gulf. The new river captured the older drainage to form the ancestral Colorado River, which in turn started to form the Grand Canyon. Wetter climates brought upon by ice ages starting 2 million years ago greatly increased excavation of the Grand Canyon, which was nearly as deep as it is now, 1.2 million years ago. Volcanic activity deposited lava over the area 1.8 million to 500,000 years ago. At least 13 lava dams blocked the Colorado River, forming lakes that were up to 2,000 feet (610 m) deep. The end of the last ice age and subsequent human activity has greatly reduced the ability of the Colorado River to excavate the canyon." The above is not just a series of random guesses dreamed up by scientists sitting in an armchair. It is the result of over a century of thorough research, which is still ongoing today. If you want to go into more detail and discover how scientists reached all of these conclusions, you'll need to do a lot more reading and perhaps even study Geology for yourself. At some point you have to decide whether you think a fringe group of so-called scientists who openly admit to having a prior commitment to the Bible, and who also have a clear agenda to try to promote their religiously-motivated belief in a young earth, somehow managed to come to a more accurate understanding of Geology, Biology, Palaeontology, Physics, Chemistry, Genetics, and several other major branches of science, than all of the rest of the world's scientists combined. The goal of the natural sciences is simply to understand the world. The progress of science occurs through publications in respected, peer-reviewed, scientific journals. It's not perfect, but it's by far the best we have, and certainly better than allowing everything to be published without peer-review and regardless of its accuracy. The overwhelming majority (more than 99.9%) of peer-reviewed papers support the idea that the Earth has formed over a long period spanning 4.6 billion years. Scientists span all major world religions, so any accusation that they are anti-God(s) or anti-religion simply doesn't wash. Often creationists resort to some kind of conspiracy-like argument in order to dismiss all of mainstream science in one fell swoop. But where is the conspiracy? Some claim that creationists are prevented from publishing their papers in mainstream journals, but the reality is that most creationists never bother to submit them. Some claim that creationism is unfairly prevented from being taught in school classrooms. But the primary reason why scientists and educators reject creationism being taught is because creationism is not science. Whatever your personal reasons for dismissing or rejecting major fields of scientific research, I'd urge you to at least look into how scientists reached their conclusions, before deciding that you disagree with them. Focus on their methods, and weigh up for yourself whether their evidence supports the conclusions they draw. Besides, if you want to argue against the views held by mainstream scientists, you will be far more persuasive if you understand the subject at least as well as they do. But if you choose to reject mainstream scientific views without ever properly understanding them, you are no better than those who reject the Bible having never read it. If you genuinely seek the truth, you have to start by firstly accepting that your current view may not be it. And then, if you do care more about what is true than simply protecting your prior beliefs, then you will ask different questions in order to get there. Follow the evidence, wherever it leads, and be brave enough to accept the outcome. That is intellectual honesty, and courage. May you always remain curious about the world.